Canadian rap artist Baba Brinkman riffed on mathematical biology this spring as NIMBioS Songwriter-in-Residence. 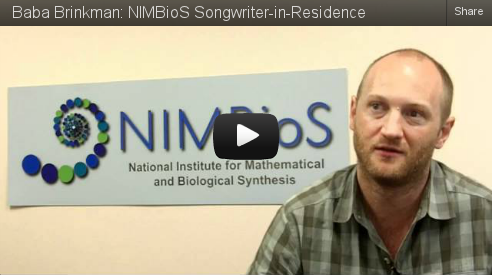 In this interview, Baba talks about what it’s like to be the bard of modern biology as resident songwriter at NIMBioS. The video also includes clips from his excerpted performance at the University of Tennessee of his award-winning Rap Guide to Evolution, co-sponsored by NIMBioS and UT’s Department of Ecology and Evolutionary Biology. To listen to the song in its entirety, visit the NIMBioS songwriter webpage. The track will be the lead single on Baba’s forthcoming “Informatic EP.” More tracks for NIMBioS are in the works. Baba has been busy since leaving NIMBioS. Just released is Baba’s newest Rap Guide to Evolution music video, “Artificial Selection,” the final in a series of ten produced with support from the UK’s Wellcome Trust. Later this week, Baba will share a stage with Stephen Hawking as a part of the Luminaries Series at the Seattle Science Festival.